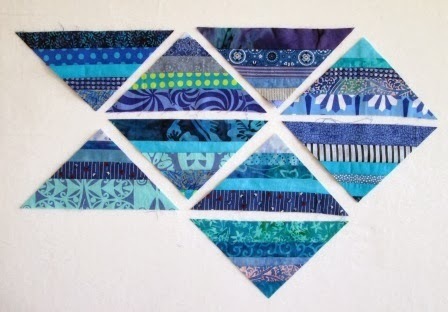 Light Blue has been the colour for the Rainbow Scrap Challenge this month. I got some string triangles done this week. I did not really worry about only using the light blues but tried to make it mostly lighter. I then worked on the 6 1/2"sq crumb blocks. Again, I most started with the lightest of the blues and let medium and darker ones migrate in. You can see I love the turquoise blues. I have a total of 14 blue crumbs. I could still do some more blue. Maybe later this week. I have a few random blocks I could do. Maybe Butterflies or some kind of pieced flower blocks. I had trouble stopping the crumbs. I find that once I have a mess of the littlest bits I just can not stop making larger bits. I did a few more Red ones. Some were shown last month but I was not sure which ones so here are all 10 of them. The drawer of crumbs is getting full. I thought it would be fun to show the piles I have made so far this year. 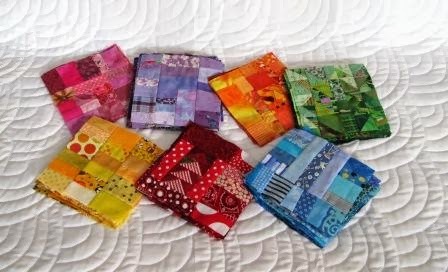 Soscrappy has a linky party for us all to show off our Rainbow Scrap Challenge. 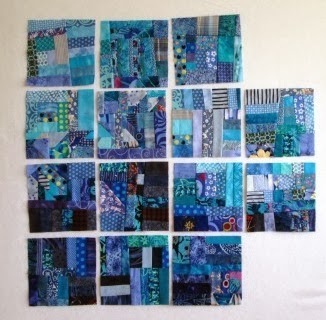 Go see what other quilters are doing with their scraps. There are some great ideas. You can join in the fun any time. You do not need to start in Jan (I started in January of 2011). Edit: to answer the comments. I do not make the crumbs on paper. I just sew small pieces together and add to each part. Then when I think it is big enough I do a final iron and trim it down. I have a ruler close by the machine. The little flying geese are mostly left overs from sewing binding together. I end up with lots of little triangles. Your crumbs are so pretty! I am getting behind in my crumb blocks. I especially love your batch of red ones. My reds are not as fun because I don't have much variety. I'm sure that makes the difference. I love strings too! I bet you and I could have a real scrap marathon together. Your collection of blue fabrics is gorgeous. Love your crumb blocks! 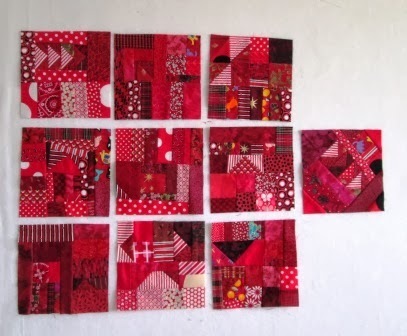 Love seeing all your crumb blocks - it's just fun seeing so many color shadings and fabrics together! Lovely collection of blocks. I really do like using up all of my crumbs and strings too. Good show! Love the crumbs... haven't tried that yet.